After Field Day I came home and started to look through my files on antennas for 80 meters. I always clip out all the articles out of QST and put them in different file folders for later viewing. Have been doing this since 1980. There are a lot of good articles that get lost for good if they are not put into ARRL publications. I was looking through my antenna folder and spotted an article about making a J-Pole out of 300 Ohm tv twinlead by KD6GLF. I thought this was very interesting design and all the applications it could be used for. After moving from Holbrook, MA to Lakeland, FL (just east of Tampa and the Lighting Capital of the U.S.A.) the last thing you want to do is leave a vertical on a tower plugged into your radio in the shack. The rainy season is the worst and storms will come in in a matter of minutes which makes it hard to monitor the local repeater. That’s when a light bulb went off an a idea was born! Why not make the antenna out of 450 ladder line and a inside free standing antenna that you could run some power into. There are numerous other applications an antenna like this could be used for. Special event stations, hams that can’t put a outside antenna up due to deed restrictions, APRS and the list goes on left to your imagination. The best part about it is that it can be used on 2m and 70cm and it is cheep and easy to build. I built two versions -- one free standing and one backpack version for camping. Velocity factor is the amount of time it takes a signal to travel down a length of wire compared to the amount of time it takes to travel the same distance in free space and is expressed in terms of the speed of light as a percentage or a decimal fraction. Example: RG-8 coax is 66% velocity factor which means the signal travels 66% of the speed of light down the coax. 450 Ohm ladder line has a velocity factor of 91%. L ¾ wave radiator = 8856 * .91 = 8058.96 / 146 = 55.198" or 55 3/16"
L ¼ wave stub = 2952 * .91 = 2686.32 / 146 = 18.399" or 18 3/8"
Cut a piece of ladder line 57¾" long. Measure up 4" from the end and strip it down to bare wire. From the same end, measure up 20¾" and cut it. This is the stub. Cut out the wire and webbing above the cut you just made except leaving a small piece of webbing near the top for hanging. The diagram I made with the dimensions are right on and I cut my second J-Pole to it and didn’t even have to move the shorting bar. The only way it would be different is if the velocity factor was different from a different manufacturer and you should be able to move the shorting bar up and down to obtain a match. As I mentioned, the first way to obtain a match is to cut the elements. When first cutting the ladder line you cut it longer than the diagram and you cut the elements at a 1:3 ratio. For example, cut 1/8” off the stub and 3/8” off the radiator until you are close and then use the shorting bar for fine adjustment. Put a SWR meter at the antenna between the small pig tail coming off the antenna and the feed line. Go to 144.300 MHz and check for SWR, then go to 147.300 MHz and check for SWR. 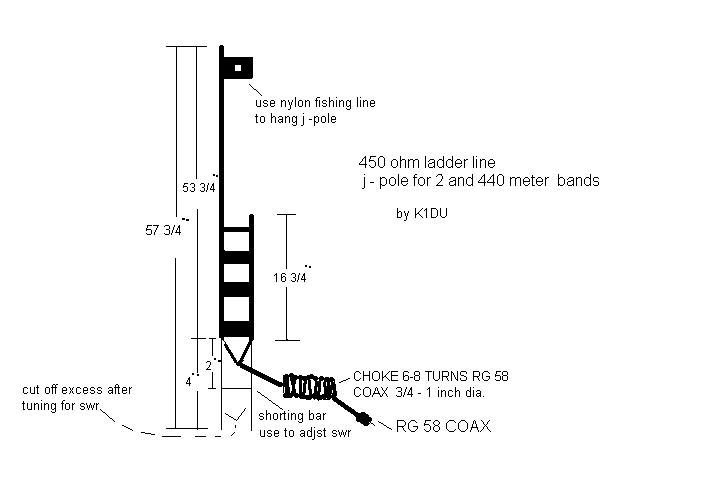 If you have a 1:1.1 SWR at 144.300 MHz and a 1:1.6 at 147.300 MHz then your antenna is long, so move the shorting bar toward the coax connection to shorten the antenna. If the opposite is true and your antenna is short, move the shorting bar toward the end of the antenna to lengthen it. When you have obtained a good SWR match, solder the shorting bar. Because we matched the small pig tail of coax with the antenna you should be able to use any length of coax with the J-Pole. When operating the J-Pole, keep it away from other objects as it will couple and degrade the SWR as well as the signal. When I put mine in pvc, it did degrade the SWR to a 1:1.7 SWR. You can run 10 to 15 watts no problem, however if you go to 50 watts the SWR will climb to 1:2.1 and your radio's protection circuit will drop the radios output to 30 watts. With the backpack version, there is no problem running full 50 watts plus. The J-Pole can also be built for 6 and 10 meters using the formulas and cut it a little longer and have some fun with it! The current time is 2019-04-21 16:05:28 PDT (-0700). This page has received 40724 hits since January 18 2009.